etc). Candidates having cleared CSIR-NET/GATE will be preferred. Desirable Qualification: Candidates having experience in cloning, protein purification, molecular biology techniques and bioinformatic tools. further depending upon satisfactory performance of the incumbent. • 2. The engagement for the projects is purely on temporary basis and is co- terminus with the project. institute and will not confer any right to the incumbent to any claim implicit or explicit on any position. candidates have to make their own arrangement for their stay. project. Applications made through e-mail would not be entertained at all. 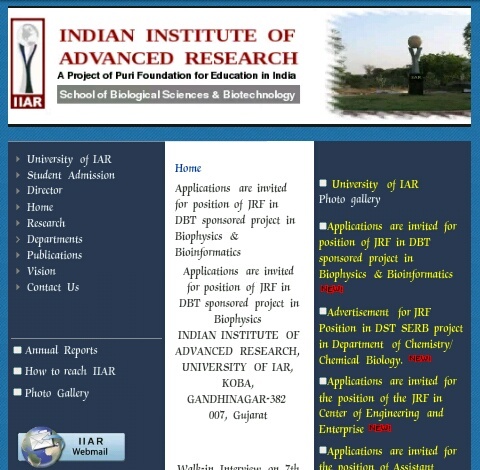 Advanced Research (IIAR), University and Institute of Advanced Research, The Puri Foundation for Education in India, Koba Institutional Area, Gandhinagar- 382 007, Gujarat, India.